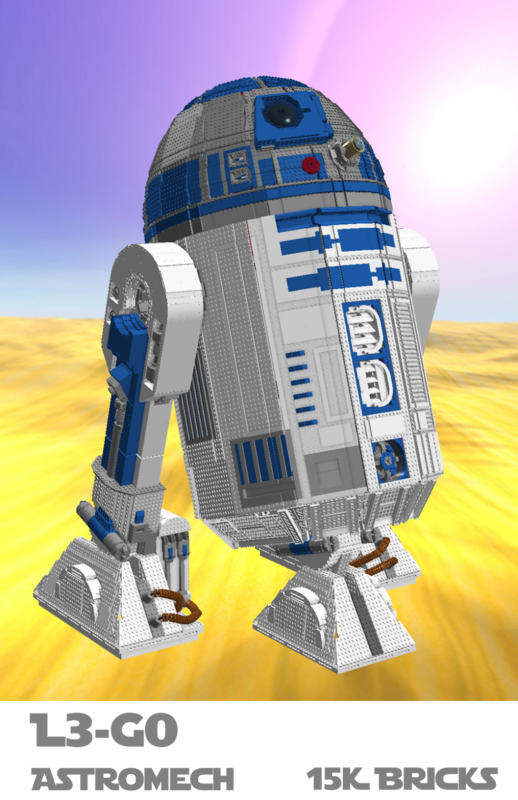 L3-G0 is the world's first, full size working Lego R2-D2, at least that I know about. L3-G0 is entirely a fan creation. After we started building we heard rumor of another one, and eventually Legoland California did exhibit a version. 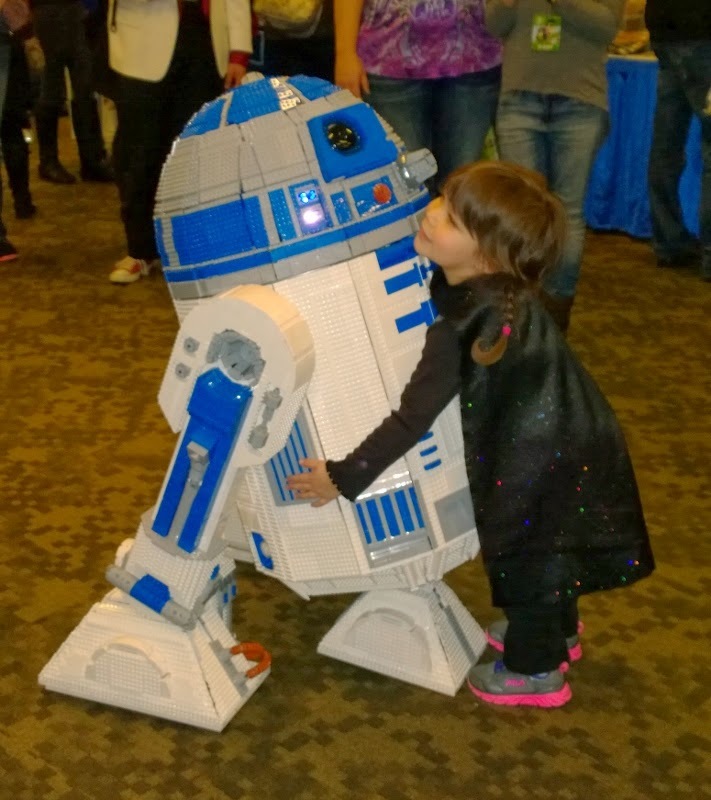 Then we went to Emerald City Comicon in 2013 and saw some of the wonderful Astromechs there. Of course I wanted to build one, but quickly realized it'd be a ton of effort, cost a lot, and I wasn't terribly familiar with the materials. It should've been obvious, but "gee, I wanna build a droid" sat in one part of my brain while "I wonder what I'll build next in Lego" sat in another part. Eventually we came to the obvious conclusion: "Let's build an L3-G0". Don't know why it took so long. Normally we grab a bunch of bricks and start building, then get more bricks, but for various reasons I started toying around with some of the sections in Lego Digital Designer to see if some of my ideas were practical. Of course, once I started, I forgot to stop. Then we had 15,000 piece model pretty much figured out, and all needed were acquiring the bricks! (Well, and some sort of frame, and some motors, and some electronics). The first part of L3-G0 was ready for Brickcon 2013 in October, about 3 months after starting the build. The as-built model deviates extensively from the LDD model, and he's got an internal wood and aluminum frame. He was completed in time for Emerald City Comicon in March, almost 9 months after starting the LDD designs. L3-G0's fans love him. The model is based on plans from the R2-D2 Builder's Club (Astromech.net) Of course brick isn't as finely detailed as manufactured parts, but he's pretty close to club spec. Unfortunately though some ideas were re-used, Lego is pretty thick compared to most of the club materials, so most of the structure is unique to L3-G0. He also doesn't have to support as much weight as the heavier R2-D2s, so that influence his design. At Brickcon his head was controlled by a Lego Mindstorms EV3, sounds were provided by a Microsoft Surface, lights blinked with an Arduino and all of it programmed from a Surface Pro. Currently he has a radio-controlled system with chain drive electric scooter motors turning 4 wheels in each foot. The center foot has two casters, and all 3 ankles can bend. His head turns with a Pololu drive motor with a rubber wheel that spins the VXB bearing (smaller than club standard). The radio receiver is connected to simple motor controllers that provide an appropriate signal to the motors. Sound is controlled by a 2nd 12 channel transmitter with the receiver hooked to an MP3 "trigger". It's amplified by a cheap 20amp amp, hooked to Polk car speakers. An arduino still controls the head LEDs, which get power from wires connected through a slip ring so they don't get tangled. Its all still programmed by a Microsoft Surface Pro. L3-G0 moves around pretty well, though there's usually room for improvement in these kinds of projects. He also turns his head, beeps, and blinks lights. Eventually we want to do more (other builders gasp when I mention 2-3-2 with Lego), but I don't seem to aim small. I'd also like the remote to be a Surface, and have a Lego EV3 doing most of the internal controlling, but that's probably a ways off. L3-G0 appeared at Brickcon 2013 as a static model. L3-G0 was fully functional for Emerald City Comic Con (ECCC) in 2014. 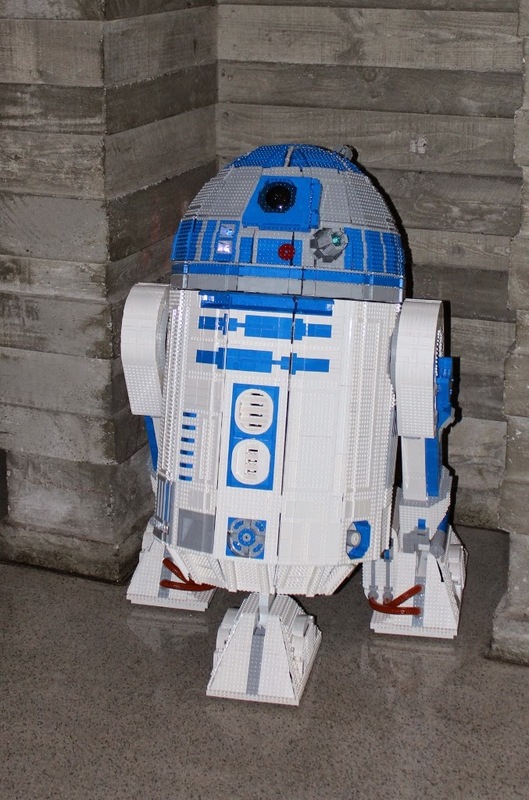 L3-G0 will appear at Brickcon 2014, though space constraints at the venue may limit his movement. We're hoping to get to Star Wars Celebration in 2015, but aren't quite certain how to safely move 16,000 bricks 1,000 miles without ending up with, well, 16,000 bricks! Height: 107cm tall - 42"
Computers: Currently 2 Arduinos with dedicated motor, sound and RC receiver controllers, programmed by Microsoft Surface Pro. L3-G0 is built by Shawn & Lara Steele with help from Nikita Steele, Laurel Lee Steele and Hosik Lee. The Steele's are members of Sealug, the Seattle Lego User's Group, the R2-D2 Builders Club, and the Pacific NW R2 Builders Club. We also have a "thanks" page for people/groups that helped with materials. L3-G0 is entirely fan-built. We aren't affiliated with Lego, Lucasfilm, or Disney.